Mon, Feb 11, 2019, 10:08 pm SL Time, ColomboPage News Desk, Sri Lanka. 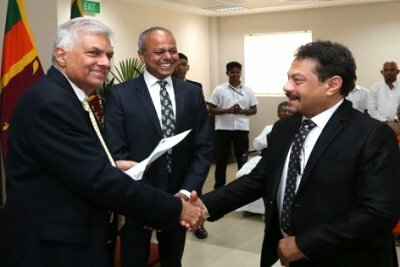 Feb 11, Colombo: Six new electoral organizers of the United National Party (UNP) have received their letters of appointment today (11) at a function held in Temple Trees under the patronage of Prime Minister Ranil Wickremesinghe. Two former electoral organizers of the Sri Lanka Freedom party (SLFP) are among the new UNP organizers. Former SLFP electoral organizer for Aranayaka, former Deputy Minister of Health, Lalith Dissanayake has obtained the membership in UNP and has been appointed as the UNP organizer for Aranayake electorate. Former provincial council minister and SLFP's Senkadagala organizer Thilina Bandara Tennakoon has been appointed as the Pathadumbara electoral organizer of the UNP. Popular singer Rookantha Gunatilake has been appointed the Dambadeniya electorate organizer and MP Kavinda Jayawardena has been appointed as the organizer for Negombo electorate. Manjula Bandara has been appointed as Wariyapola electorate organizer and Udaya Wijenayake has been appointed as the Hiriyala electorate organizer. General Secretary of the UNP Minister Akila Viraj Kariyawasam, Ministers Sagala Ratnayake and Malik Samarawickrama also participated in the event.